If you are new to Joomla, you can check our detail guide of How to install extensions in your Joomla site. This guide not only shows you how to install extensions but also how to set up the new installed extensions. Image folder: select the folder that contain images you want to display in your slideshow. Gallery: list the images from selected image folder. Slideshow Type: select slideshow type: Fade, Slide, Vertical Rotate, Horizontal Rotate, Rotate and Custom. For slideshow type: Custom, it has different settings and also different front-page. Autoplay: you can enable or disable the auto play option for slideshow. Show Navigation: you can show or hide the navigation that allows user to move to next item or move back previous item. To add description for items, click on the image in the Gallery. Then add link, description, in the popup. Use HTML Tag to style for the slideshow description. Main Item width: set width size for main item (in pixel). Main Item height: set height size for main item (in pixel). Show Thumbnail: you can show or hide thumbnails that allows user to navigate to any item thay want. Thumbnail width: set the width size of thumbnail (in pixel). Thumbnail height: set the height size of thumbnail (in pixel). You have seen our slideshow in JA Zite Demo, it uses JA Slideshow Lite with Slideshow Type is Custom. In this part, we will use JA Zite as a sample to show you how to configure JA Slideshow Lite when you want to use slideshow type is Custom. This video shows you how JA Slideshow Lite works when its slideshow type is Custom. To add description for items, click on the image in the Gallery. In the popup, add class, link and description for each slideshow item. 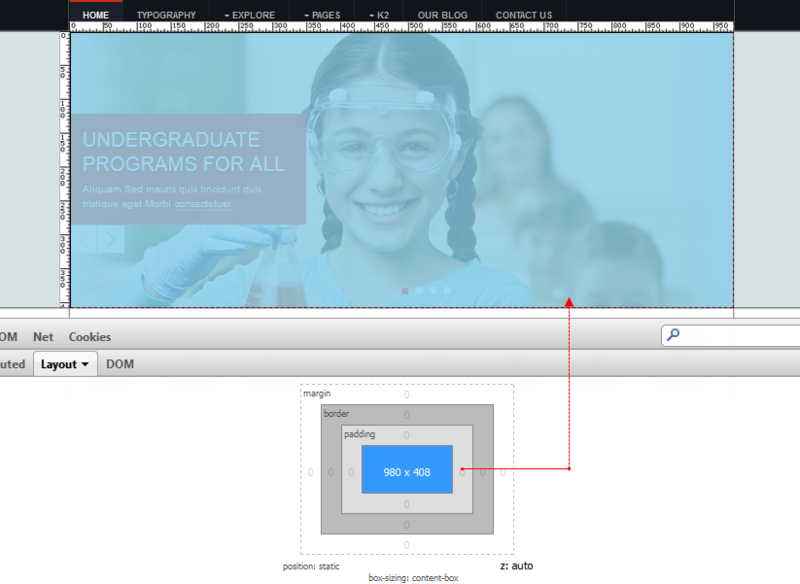 For description, you can use HTML Tags or add class to style for slideshow description. 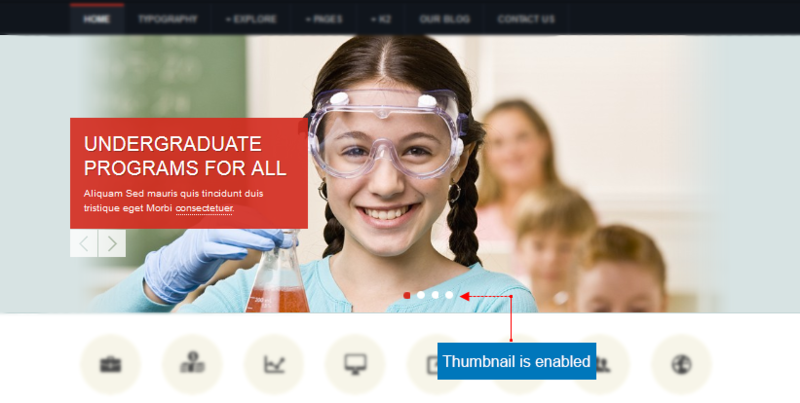 There are 3 images in a slideshow item, we call it: background image, slideshow element 1 and slideshow element 2. All the images are stored in the folder that is defined in the back-end of the module. You have to name the images with right format so that the module can get right images to display in each slideshow item. We suggest you to name images as we do in the demo site (in the image below). For the slideshow 1, the image: sl1-bg.jpg is the main image, sl1-first.png is the slideshow element 1, sl1-second.png is the slideshow element 2. Is the selected folder has images ? 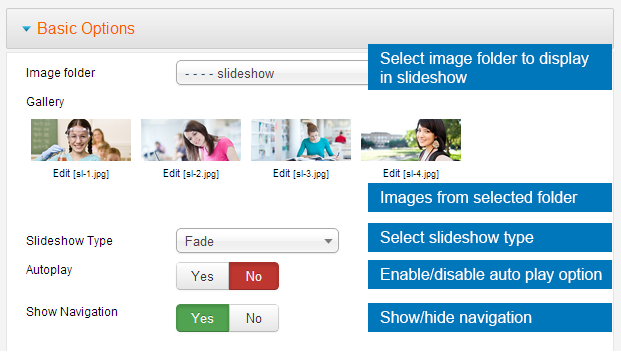 JA Slideshow Lite only supports to display images from a folder, so you have to add images you want to dispaly in the module in the selected folder.